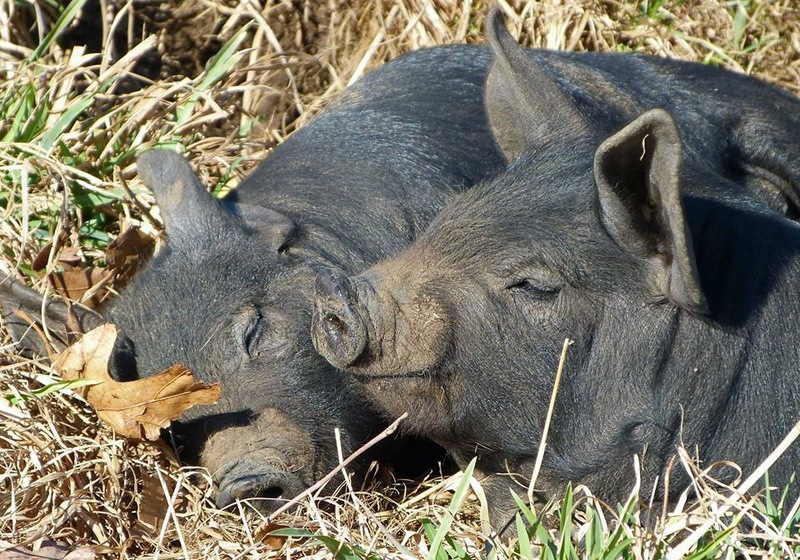 Raising pigs outdoors on pasture and in our woodlots allows them to do what pigs naturally do- root, wallow and soak up the sun. Raising happy pigs produces fresh, clean, tasty pork which gets rave reviews from our customers. Over the years we have raised many different breeds of pigs however we now raise Berkshire pigs known for their ability to thrive outdoors and produce amazing meat. Berkshire pork is heavily marbled and prized for juiciness, flavor and tenderness. Our pork is processed at Adams Slaughterhouse in Athol, Mass. "The Adams Farm Slaughterhouse is a third generation, state-of-the-art, USDA inspected meat processing facility that utilizes strict quality control standards to provide only the highest quality, fresh meat products that exceed USDA standards and a consistently applied animal tracking system that ensures a dependable and reliable service to their customers." Bacon, Ham and sausages are processed at Green Mountain Smokehouse. Green Mountain Smokehouse is a humble one-story building on the main drag in Windsor, Vermont. Its owners, Jake and Koreen Henne, are equally humble: straightforward, all business, no frills. processing facility that has a reputation for consistent quality, try our maple sugar cured bacon! !